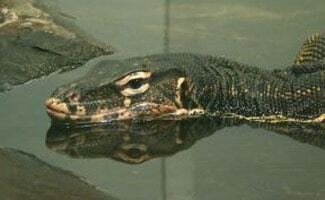 The water monitor is also known by its Latin root, Varanus Salvator. As one of the largest lizards in the world, it can grow to a length of nine feet and reach a weight of one hundred pounds! It is outsized by only two other lizards, the Komodo dragon and the crocodile monitor. The Komodo can gain more weight than the water monitor, while the crocodile can grow longer – up to twelve feet! What does a water monitor look like? Water monitors are typically grey, with yellow spots and black stripes. They are covered in round scales and their tail is half the length of their body. The water monitor’s preferred habitat consist of tropical areas, mangrove forests, areas of thick vegetation, and bodies of water. The water monitor is more common than other monitor lizards and is also easier to breed. However, due to its large size and excessive weight, it is one of the more difficult lizards to keep as a pet. Those that are domesticated require large cages with ample living room and precisely adjusted humidity levels. What does a water monitor eat? Due to its size a water monitor needs to be fed on a regular basis (daily). It eats a variety of smaller animals including rodents such as rats and mice. Water monitors are primarily found in Thailand and the Eastern part of the world. In captivity they are known to be aggressive and flighty. They use both their tail, claw, and mouth when fighting. They spend most of their time in the water and are excellent swimmers, hence their name. They are not the most difficult lizard species to breed and lay about 15-20 eggs per batch. Where in the world are water monitors? Water monitors are found in Asia, Sri Lanka, India, Indochina, the Malay Peninsula, and on various Malaysian islands. Like all monitor lizards, water monitors are are cold-blooded. They eat insects, crabs, mollusks, snakes, eggs, fish, birds, rodents, and other lizards. They enjoy to chase their prey rather than to stalk and ambush, and their forked tongue is used to smell their prey. How fast are water monitors? Can they swim? Water monitors have strong legs and are able to run fast – faster than the average human. They can also climb very well and will stay in trees to escape predators. Typical hiding places for water monitors include not only trees, but burrows and river banks as well. Living up to its name, one of the most impressive characteristics of the water monitor is that they can not only swim, but remain under water for up to half an hour. How do water monitors breed and how long do they live? Water monitors breed rapidly and well. Female monitors lay about 40 eggs a year in two clutches, and eggs are laid about 4 to 6 weeks after breeding. There are about 15 eggs per clutch, and eggs are commonly laid in termite mounds. Males are generally larger, longer, and heavier than females. Water monitors reach maturity in two years and have a lifespan of about 15 years. a water monitor is one of the coolest animals in the world and I am also doing an info report all about the water monitor. I just adopted a monitor who looks to be either a water monitor or a Savannah monitor. He is not that big; he looks to be a little less than a foot and a half. The guy that had him said he was a little aggressive and he looked to be alert. Now that I have him at my home and he is in a large Terrarium I notice that he does not stand up and uses his legs to walk. He moves them and kind of slides along. Is this normal in a monitor? Are there other signs I should be looking for to see if some thing is wrong? I am not sure what to do at this point. The only thing I know is that I stillwant to keep him.